Tourist Map of Central Sydney with attractions, museums and shopping. 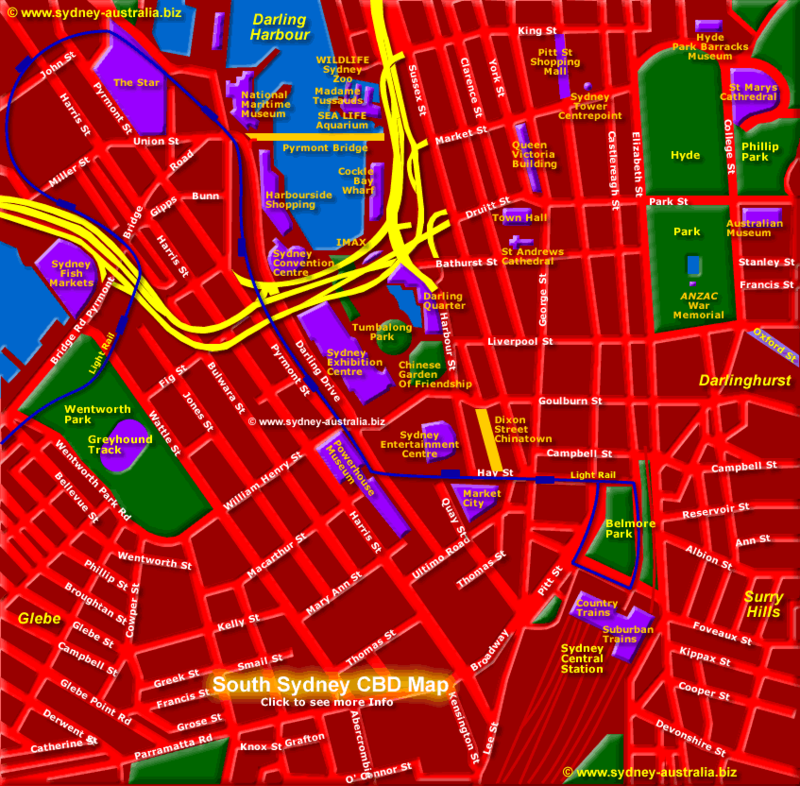 Also shows the Monorail Route (red) and the Light Rail Route (blue) from Central Train Station to Darling Harbour. See more on Sydney Darling Harbour. Map also shows the Fish Markets, Star City Casino, Central Railway Station and Wentworth Park Greyhound Track. Chinatown Dixon Street is near the center, with the Powerhouse Museum, the Sydney Convention Centre, Exhibition Centre and the National Maritime Museum at Darling Harbour. Showing the rest of the Sydney CBD Sydney CBD Map showing City Central. Linking Central Station and the inner Sydney western suburbs is the Metro Light Rail. Quick and convenient transport to Darlinghurst and its many attractions, the Fish Market and the inner suburbs west. Museums in NSW: Museums in New South Wales.